The Dovers were from Santa Barbara, California, and started their band under the name The Vandells. They began their recording career as The Dovers in 1965 with the Miramar Records release "She's Gone"/"What Am I Going To Do?" which reportedly was a minor hit in the Santa Barbara–Ventura County area. 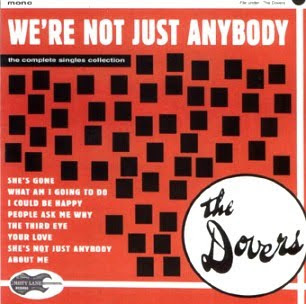 Three singles followed in late 1965–early 1966, showing The Dovers' interest in folk and pop; none of their four singles met with national success, and The Dovers broke up shortly afterward. The Dovers went largely unnoticed by music collectors until garage rock compilations came out in the late 1970s and early 80s. A cult following developed around the group, who became known among collectors for their catchy songs and wistful vocals. "What Am I Going To Do" is currently available on Rhino Records' Nuggets box set. "She's Not Just Anybody" is available on Pebbles 8, Southern California 1. In 2009, Bradford Cox of Atlas Sound sampled "What Am I Going To Do?" for his song "Walkabout". The song is a collaboration with Animal Collective's Noah Lennox.